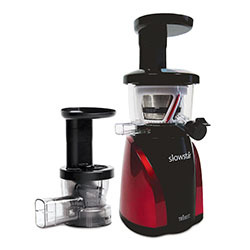 Centrifugal juicers utilize fast moving blades to cut up and break down food. 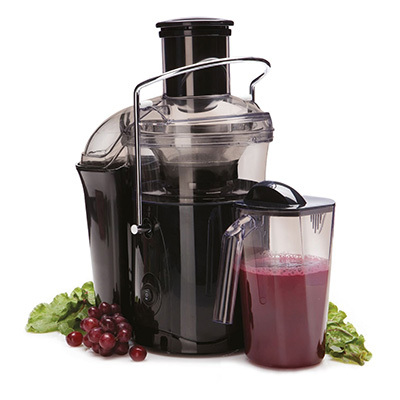 Through this process, juices are bled from fruits and vegetables and flow from the juice spout. High-power motors ranging from 600 to 12,000 watts keep these blades moving at a range of high speeds necessary for breaking down a variety of fruits and vegetables. Some centrifugal juicers feature multiple speeds designed to optimally break down specific types of foods. Speeds can range from 6,000 to 16,000 rotations per minute (RPMs). Lower speeds are designed to break down soft foods, whereas faster speeds are best for breaking down hard foods. Although they do not yield as much juice as masticating juicers and often leave you with rather wet pulp in the pulp collector, centrifugal juicers work very quickly and are perfect for people with busy lifestyles. 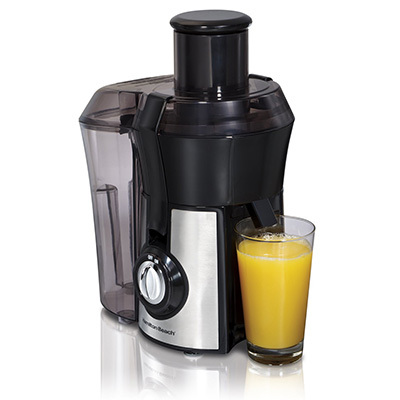 The Black and Decker JE2200B Fruit and Vegetable Juice Extractor is extremely affordable. 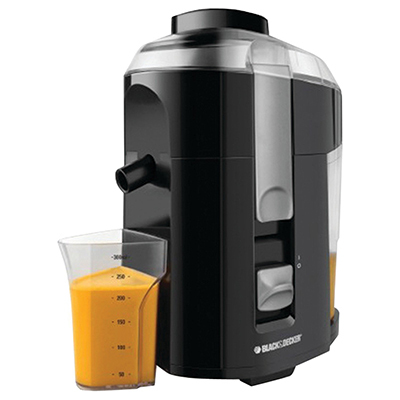 The 400-watt motor of this centrifugal juicer can easily handle the task of extracting juice from any soft food in mere moments, though it may struggle with the larger task of breaking down hard foods such as carrots. 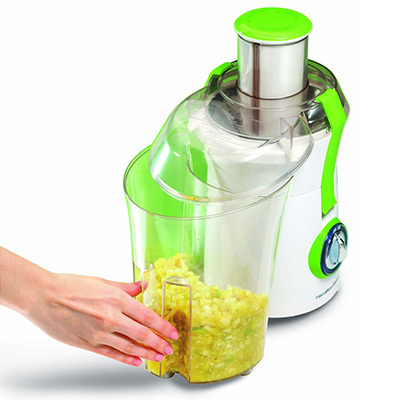 The JE2200B boasts a medium-sized external pulp extractor cup, making cleanup fast and easy. The specially designed juice cup features a pouring spout and labeled measurement lines. Unfortunately, this juicer’s small-mouthed feeding tube means that you cannot simply drop an apple or orange inside and begin juicing – extra prep time may be required when using this juicer. The Breville 800JEXL Juice Fountain Elite boasts a powerful 1000-watt motor which is built to withstand the demands of any centrifugal juicing process. Capable of running at two different speeds (6,500 RPM or 13,000 RPM), this juicer can easily break down both soft and hard foods for your juicing requirements. Special features place this juicer apart from many of its rivals. Its 3-inch feed tube, large pulp collector, and juicing bags make preparation, juicing, and cleanup as simple and fast as possible. An “overload protection system” ensures that, by shutting down the machine to allow it time to cool, the motor never overheats. The safety locking mechanism will not allow you to open the lid if the machine it running and will not allow you to run the machine if the lid is not securely attached. The drawbacks of this juicer are mostly those shared with other centrifugal juicers and are simply a part of the centrifuge design. That being said, a low juice spout does limit the size of juice batches you will be able to create. Also, many similarly-priced centrifugal juicers have multiple speed settings, whereas the Juice Fountain Elite only features two speed settings. 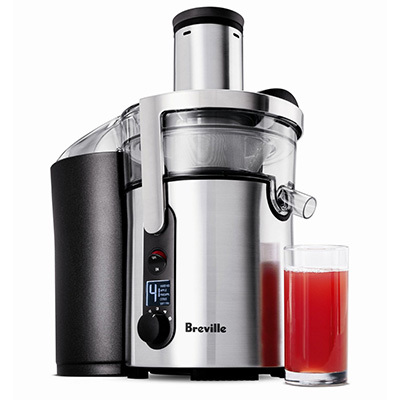 The Breville BJE200XL Compact Juice Fountain 700-Watt Juice Extractor is an entry-level centrifugal juicer. Its 700-watt motor powers a set of spinning blades which moves at 14,000 RPM. This juicer can easily break down soft fruits and vegetables, though it may encounter some difficulties when it comes to harder foods or leafy greens. This juicer has a small footprint in that it will take up very little space on your countertop thanks to its internal pulp collector. Its 3-inch wide feeder tube allows it to easily break down entire apples or oranges. The sleek and stylish design of this juicer means that it will easily match many interior designs and can be left on the counter without ruining the aesthetic ambiance. The Breville BJE820XL Juice Fountain Duo Disc centrifugal juicer is equipped with a powerful 1200-watt motor which is fully capable of powering its five varied speed settings. The five speed settings have been designed to optimize the juicing experience based on the type of fruit or vegetable from which you are planning to extract juice. Composed of durable die-cast metal, this juicer is designed to match many industrial and contemporary kitchen designs. Unfortunately, due to its size this juicer will take up a considerable amount of counter space or cupboard space. Like most Breville juicers it boasts overload protection and safety locking features designed to make your life easier and safer. Its extra-large juice pitcher features a handle, an easy-pour spout, and measurement markings. Its extra-large pulp collector makes life simple, as you will not need to empty it during the juicing process. 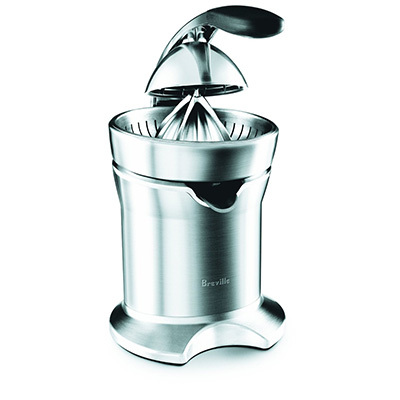 The Breville Juice Fountain Plus features a strong 850-watt motor designed to handle everyday use and foods which are typically difficult to process. It also boasts two safety mechanisms. The first is a locking arm which prevents the juicer from turning on when the lid is not securely fixed. The second safety feature is a collection of heat sensors built into the motor. These sensors detect heat levels and trigger the juicer to turn off if the motor begins to overheat. 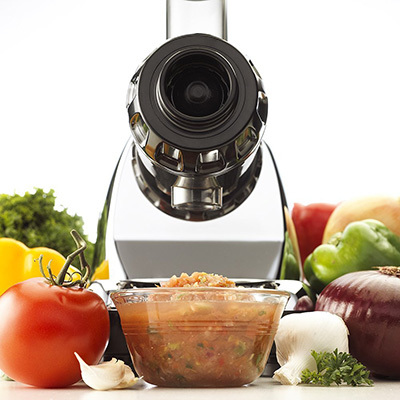 Breville’s patented “Nutri Disc” maintains low internal temperatures to preserve important food enzymes that can be destroyed in high-heat environments. Its 3-inch feed tube allows you to juice large pieces of food, thus reducing prep and cleanup time. You can easily alternate between the two speeds as you switch between juicing hard and soft fruits and vegetables. 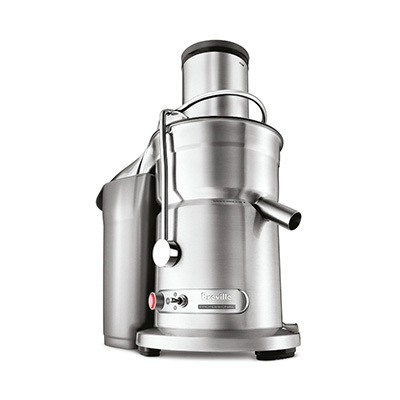 The Breville BJE510XL Juice Fountain Multi-Speed 900-Watt Juicer is packed full of power and special features which make it more than worth its price. The 900-watt motor of this juicer can easily handle the demand of both soft and hard fruits and vegetables and can maintain high speeds for extended periods of time without overheating or breaking down. Its multiple speed settings are designed to provide you with the optimal speed for juicing different types of foods on the basis of their hardness and general consistency. Two safety sensors are also included with this machine. If ever in danger of overheating, the special heat sensor will shut down the entire unit until it has reached a safe temperature. Another special sensor helps to adjust the speed setting according to the hardness and heaviness of the food you are juicing, in case you choose the wrong setting. 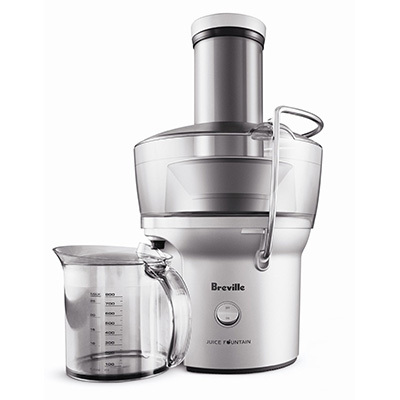 The Breville RM-BJE510XL is the re-manufactured version of Breville’s 900-Watt Juice Fountain centrifugal juicer. 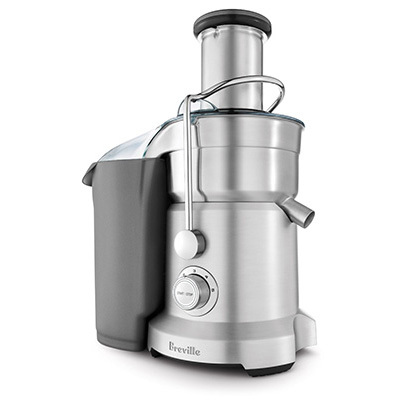 After undergoing Breville’s intense re-manufacturing and inspection process, this juicer appears to live up to the original version in every aspect. Like the original, this juicer features an extra-large pulp collector as well as an extra-large juice pitcher with a built-in froth suppressor. The 3-inch feeding chute makes it a breeze to process whole apples, oranges, and carrots. Five speed settings can be easily selected from the light-up digital display, and are designed to maximize the juicer’s ability to break down soft foods, hard foods, and every type of food in between. 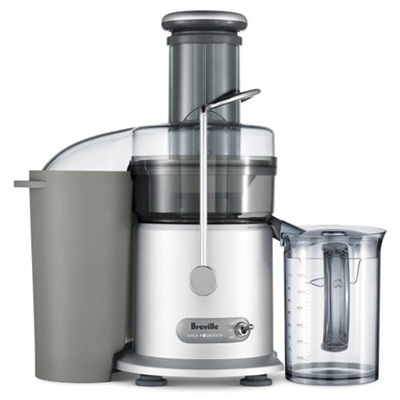 The Breville RM-JE98XL Juice Fountain Plus is a re-manufactured version of the Breville JE98XL 850-watt juicer. It has been completely inspected, upgraded, and thoroughly cleaned by the Breville company itself and has received surprisingly positive consumer reviews. The 850-watt motor included in this juicer is fully capable of handling its two speed settings of 6500 RPM and 12,000 RPM for regular amounts of time without overheating. This motor would be hard-pressed to create large batches of juice, but the overload protection system would ensure that the motor never overheats. This juicer features a large, one-liter juice pitcher with a pouring spout, measurement lines, and froth separator. The extra-large pulp collector bin makes juicing and cleaning fast and easy. All removable non-electrical parts are dishwasher safe. The Cuisinart CJE-1000 features a strong and durable 1000-watt motor designed to handle the high speeds required by a centrifugal juicer such as this. Its two-liter pulp collector is one of the largest on the market and promises to allow you to create large batches of juice without having to stop to empty it. 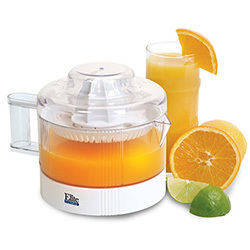 The 10-ounce juice pitcher connects to the juicer and even features a lid to stop spillage and splatter problems. The large feeder tube will allow you to feed entire apples, oranges, and carrots without a problem. 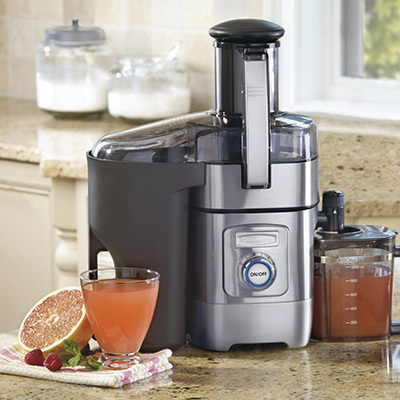 Prep, juicing, and cleanup time have all been reduced by the combination of the large pulp cup, connectable juice pitcher, and large feeder tube. 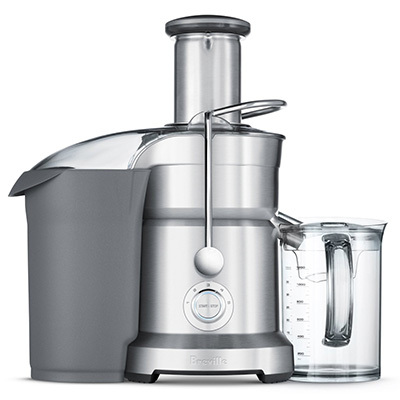 All removable non-electrical parts of this juicer are dishwasher friendly, which also reduces clean up time. 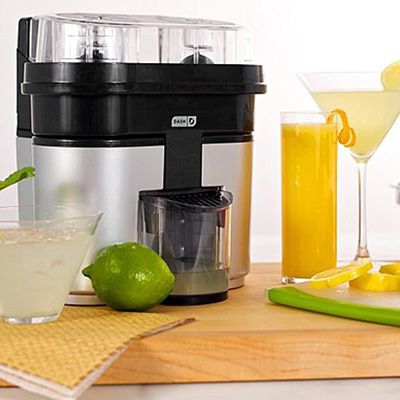 The Hamilton Beach Big Mouth Juice Extractor is an extremely affordable and decently-built centrifugal juicer. It features a 3-inch wide feeding tube, designed to reduce the amount of prep and cleanup time involved in your juicing experience by allowing you to place entire fruits and vegetables inside. The large pulp collector bin decreases the amount of time it takes to create delectable juices, since you will not need to stop to empty very often. Its 800-watt motor can handle most tasks, although it may need breaks when performing large jobs in order to keep it from overheating or melting nearby plastic. The plastic encasement may be less durable than many stainless steel juicers, but it also makes this particular juicer much more affordable. The Hamilton Beach 67608A Juice Extractor features an 800-watt motor and is available in a one-speed option and a two-speed option. The two-speed option is much more capable of breaking down different types of foods, including soft foods and hard foods. The wide-mouthed feeder tube included in this machine allows you to quickly and easily juice your fruits and vegetables with little to no preparation time required. The easy-to-remove pulp collector cup located on its exterior is much larger than the pulp collector cups included with many other centrifugal juicers. Detachable, dishwasher safe parts make this juicer very easy to clean. Hamilton Beach has even included a special cleaning brush for hard-to-reach, non-removable pieces. The Jack Lalanne 100th Anniversary Juicer is a centrifugal design which features an 800-watt motor which is capable of handling small, short-lived jobs of breaking down soft or hard fruits and vegetables. It can function at a low speed for soft foods or at a high speed for hard foods. Its large footprint is made larger by its extra-large pulp collector cup and juice pitcher, though both are also likely to be helpful tools. The juice pitcher fastens to the machine in a way which is virtually guaranteed to make spillage and splatter impossible. Unfortunately, this machine has received considerable negative consumer reviews that call its quality into question. 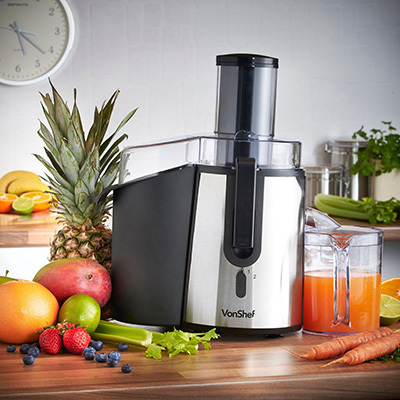 The VonShef Professional Whole Fruit Juicer features two different speed settings designed to match two different types of foods – hard and soft. The higher speed setting of 18,000 rotations per minute (RPM) is supposed to be used for hard foods, whereas the lower setting of 14,000 RPM is meant for soft foods. These may not be the optimal speed settings for these types of foods. This juicer also features a 700-watt motor, which may not be equipped to handle the high RPM speeds this juicer promises to deliver. On the positive side of things, this VonShef juicer is able to process entire foods via its 3-inch wide feeding tube, significantly decreasing prep and cleanup time. The 70-ounce pulp collection cup also reduces the amount of time it takes to create juices by alleviating the need to empty the pulp every few minutes.